Here is some information about what you can expect with Northview Community Swim Team. Sign up for the mailing list. This is how we stay in touch. Most of the information sent to the mailing is also posted here on the website. Watch the practice calendar. Sometimes we have to cancel practice. We share the pool with the rest of the Northview Community so try to schedule around this. Things happen. We’ll always try to give as much notice as possible. Also, if Northview schools are cancelled for any reason, that means we have to cancel also. Volunteer. We need volunteers to help run swim meets and also to stock the concession stand. Everything is run by volunteers and all proceeds go to the team and to the coaching staff. Meet Registrations. Athletes are expected to compete in meets and optionally in invitationals. Athletes will automatically be entered into all meets. You must opt-out or excuse your swimmer from a meet via online form. Note, if your swimmer doesn’t compete in a meet, you may affect other swimmers ability to participate in relays. Meets vs Invitationals – Meets are scheduled events that our team participates in. Your athletes are expected to participate in all meets. All entry fees for meets are covered in your registration fee. Invitationals are optional extra meets. Invitationals tend to have fun themes and are run just like meets. The cost of participating in invitationals is not included in your registration fee. Your swimmer will need a competition swim suit. These suits are usually a little tight. Boys usually wear a jammer style. Our recommended suit is usually available in our team store after the start of the season. We try to keep the same suit for 2 years but the vendors only produce so many and quantities may become limited. If you choose not to use our recommended suit, please find a similar black and red one or an all black suit. You may also want one or more practice suits to keep your competition suit tight. Suits do wear out. Your swimmer will need competition style swim goggles. These are usually available in our team store. Many of our coaches recommend the Speedo Vanquisher style. Goggles frequently break and get misplaced. Swimmers should have a spare set. Coaches do not have extra pairs to loan out. Swimmers with long hair will want to keep their hair managed. Hair ties are acceptable for practice, but swim caps are better. Swim caps are recommended for all meets. Northview swim caps are usually available for purchase in the pool office during practices for $5. Towels. Two towels for meets, one to sit on and one to dry off with. Comfy clothes for changing into after practices and meets. They are crowded. They are hot. You’ll sit there waiting for your athlete’s event which may only be less than a minute long. Other parents and supporters are in the same situation. Be respectful. You want to watch your athlete perform, so do other parents. Swim meets are run in heats. Usually heats are grouped to be competitive. Just because your swimmer wins their heat, they do not necessarily win or place in the event. You must pay attention to the times in all the heats. This is our most frequently misunderstood question. There are multiple heats per event. Ribbons and places are awards for the event, not the heat. You should encourage your swimmer to compete against his or her own times and strive to improve. In general, the coaches will choose which events your athlete will compete in. They make these decisions based on their experience with the intention to expose athletes to different strokes and distances as well as to challenge athletes. The coaches also want the athletes to succeed and be confident in their skills. Coaches will also strive to participate in as many relay races as possible. This is why it is critical that you register for meets and also arrive on time for warm ups. Your swimmer not attending could mean 3 other swimmers cannot compete in a relay. How do we know the lane and heat my swimmer is in? We won’t know heat and lane assignments until the morning of the meet, after the other team lineups have been set and no-shows scratched from the events. So literally at about 9:00 AM when the Saturday morning meet is starting. There will be heat sheets available for sale when everything is set and that will have heat and lane assignments. How do we read the relay events? For example, my swimmer is in the 200 freestyle relay with an B1. For the 200 Freestyle Relay, your swimmer is on Relay Team B (that’s the letter) swimming 1st (that’s the number). What do you mean by writing the events on my swimmers arm? Once the meet starts, athletes need to listen for their events to be called. They will be marshaled ahead of time to keep the meet moving. This is where it helps for the swimmer to have event numbers written on his or her arm. Note, we won’t know the heat and lane numbers until the day of the meet. So, just write the event number, distance and stroke on your athlete’s arm. Please do this the night before, this is a parent’s responsibility. Coaches will be occupied warming the swimmers up. 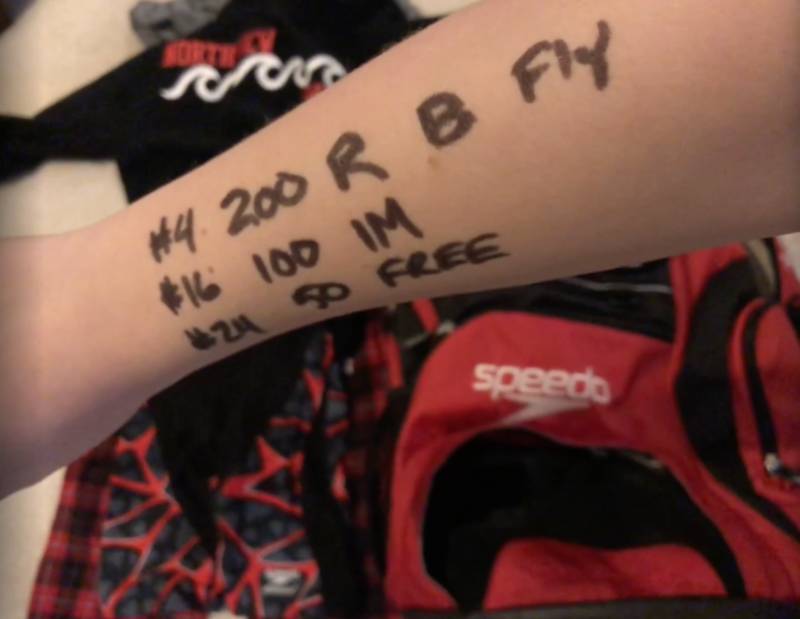 For example, this swimmer is swimming event #4, a 200 yard relay (that is what the R is), he is in the B relay and will be crushing the fly stroke. He is also swimming event #16, the 100 yard individual medley. Then finishing the day in event #24, the 50 yard free. Event numbers are not the same for every meet – so double check. Also note in the background, this swimmer’s parents pestered him enough to lay out his swim bag, competition suit, goggles and comfy clothes for after the meet so he was all ready to go in the morning. NT stands for “No Time” which means your swimmer has not participated in that event in a meet before to register a seed time. Once your swimmer has competed in an event his or her best time will be the seed time for future heat assignments. What does the asterisk mean next to the time on the entry? This means the swimmer doesn’t have a qualifying time for this event for this meet. These really only apply at the A meet where your swimmer has qualified in one event, now they must swim all their events at the A meet. So you may see an asterisk next to a seed time where your swimmer has not had a qualifying time. Can the assigned events change? Of course, there are always adjustments the morning of the meet and things can change. What does the little x mean next to the time on results? This just means the swimmer’s finish was not scored in the overall meet. Only so many swimmers in each event contribute to the team’s total score. This is also why we encourage your athlete to compete against his or her own times over the course of the season. What does the big X mean next to the time on results? This means the swimmer was swimming exhibition and his or her time is not scored in the meet. This could be because the swimmer is in the wrong age group or is competing in too many events, among other reasons. My swimmer was disqualified (DQ), why? Unfortunately, unless a coach actually saw what happened, we may never know. The official will disqualify swimmers for any number of reasons including improper stroke, improper turn, early start or many others and does not tell the timers why. The season will culminate in conference meets. Meet qualification is also frequently misunderstood aspect. All athletes who participated in at least 2 meets during the regular season are automatically qualified to compete in the B Conference Meet at the end of the season. However, if your athlete finished with an A Meet qualifying time (updated 5/15/2016) during any regular season meet, he or she will compete in a the A Conference Meet at the end of the season. Qualifying for any single event means your athlete will compete only at the A meet. Sometimes, swimmers do not qualify for the A Meet until the last meet of season (which is great! That means he or she has been improving all season long) and this can make scheduling difficult at the end of the season. Please follow the mailing list for these tight turn arounds. Your swimmer will compete in only one Championship meet – A or B. If you swimmer is 12 or under and not on the list of A meet qualifiers, he or she will attend the B meet.